Choosing a major can be one of the most strenuous choices you will have to make in your college career. What if you choose wrong and regret it? What if you can’t get a job in your field? What if you end up hating it? SNU is a great place but finding your niche is important. Being in a department that you aren’t truly passionate about, could be the reason you may not be enjoying your college experience. As an ex-music education major, one year, in the major I didn’t really enjoy, was a struggle for me. I thought it was just SNU and that I needed to transfer out to enjoy college. I began to ask myself questions like, “What do I actually enjoy doing?” or “What do I find myself gravitating towards when I’m bored?”. This led to thoughts such as, “Should I change my major?”, “Transfer to another school?”or “Drop out of school and become a yoga instructor?”. Getting a bachelor’s degree is key in this ever evolving society, and I just needed to figure out which major to spend my time and (parent’s) money on. Putting as much pressure as I was putting on choosing a major, was stressing me to no end. I realized we live in a changing world, and began to have conversations with one of my college pastors, Rev. Brit Bolerjack . She said, “Our parents or even our grandparents’ generations expected to get a job and keep that job for 30 years and then retire. I’m just not sure that’s how it works anymore. Companies come and go. Layoffs and downsizing happen. You may not want the job you get after college for the rest of your working life”. You don’t have to be stuck in something you’re not passionate about. Jim Smith, mass communications professor, began as a theology major here at SNU. He believed he had felt called to ministry at a church camp when he was twelve-years-old, and proceeded to tell all the people in his life. He said he started feeling doubts to that direct calling of ministry around age sixteen, but kept moving on with it because he had already told so many people. Smith found his passion after trying out for a one-act play and of course, changed to a speech and communications major. He now works as a professor for the same department he majored in and says, “Find a professor you love, because having someone mentor you through your major is a big plus. If you have a professor you love, you’re going to want to do better and more, because you love that professor. Find something that you enjoy doing, something that you really love because that will make your college experience so much easier”. Reiterating Smith’s statement on doing what you love, Bolerjack says, “I would encourage a student to get a degree in whatever it is that excites them most. Frederick Buchner said, ‘The place God calls you to is the place where your deep gladness and the world’s deep hunger meet’. Take time in college to fall in love with learning and growing. Study especially the things that excite you. Pray that God will use your passions to change the world. And be open to whatever that looks like. In ten years when you change course, you can always get a masters in your second love”. The pressure of college can make you feel like you will never get through and leave you feeling lost when you graduate. The most important thing you can do for yourself is to choose a field of study you love. Even if that changes within your four years here, go for it. It is better to stay an extra semester doing what you love, when you figure out what that is, than to kill your self-esteem and stay in something you aren’t truly immersing yourself in. 1) I would encourage them to do a strengths insight session to become more familiar with their strengths and how their strengths might serve them in different career fields. 2) Spend some time exploring possible majors with the student by looking at what courses are required for the major and having the student read the course descriptions. Often a student can narrow their focus by determining if the classes required for a major sound interesting/exciting to them. 3) Encourage the student to take an introductory course in a major if they are interested. 4) Refer the student to Renew for additional assessments/feedback regarding a major/career choice. These steps are hopefully a last resort after doing some soul searching for yourself. Misty is always available for conversation, just email her at mjaggers@snu.edu. If you are interested in changing your major, you can do so, at any time, in the registrar’s office on the basement floor of the Bresee building (the building right next to where chapel is). 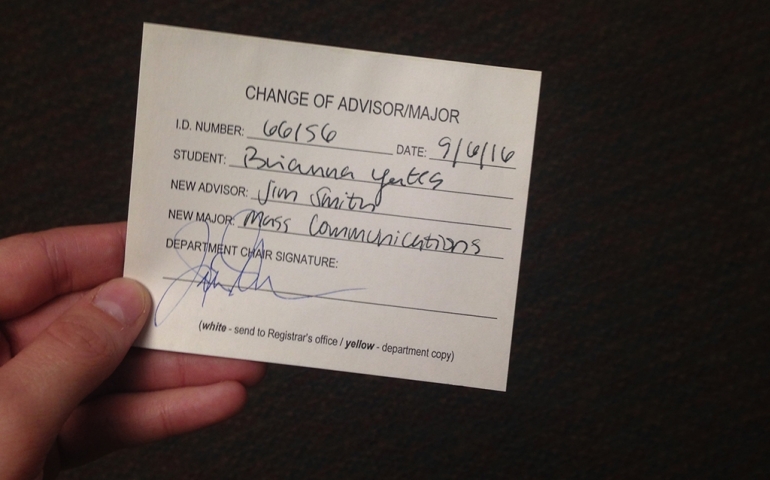 It’s as simple as a small slip of paper and a signature from your new advisor, but that small piece of paper can be the first step towards a more fulfilling life.